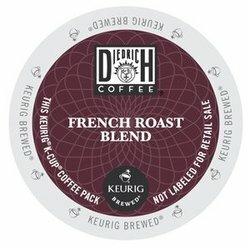 Diedrich Coffee - French Roast - K-Cups. A toasty aroma coupled with a hint of molasses flavors. A dark roast coffee with a pleasant finish. Each box contains 24 single serve K-Cups. All of our K-Cups are to be sold and used in a at work environment.